How Do You Say “Happiness” in Munich? The German word for ‘happiness’ is Freulichkeit. But Steven discovered a better way to say it in Munich: Haxen. 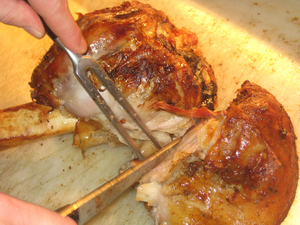 This oversize ham hock spit-roasted over charcoal turns up throughout Bavaria. And no one does it better than Haxenbauer (“Farmer Ham Hock”) in the heart of historic Munich. 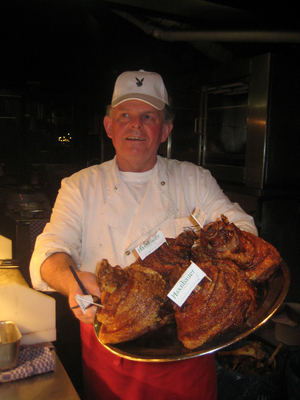 Haxenbauer has been serving ham hocks and other stolid Bavarian fare since 1915. And for 40 of those years, spit master Rolf Scheurecker has been choosing the right ham hocks (fresh only and cut from the hind legs) and applying the right seasonings (which include juniper berries, marjoram, and mugwort). 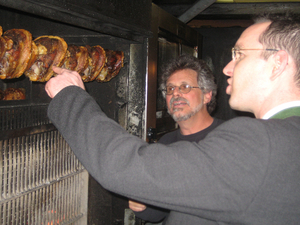 The haxe are cooked on vertical spits next to a charcoal fire for the 2 hours it takes to make the skin crackling crisp and the meat juicy and tender enough to cut with the side of a fork. A well prepared haxe could hold its own with any pork shoulder in North Carolina. But your best option, of course, is to try it in its birthplace.